Toluna Influencers is a survey site that claims you can have your voice heard and get paid at the same time by joining. But is Toluna legit or a scam that is a waste of time? I have been a member of Toluna for a long time by now, and if have tested it thoroughly. So if you want to know what the site is about, if it can make you money, and if it is worth your time, keep reading. I will answer all these questions and share my experiences and advice to this survey site in this Toluna Influencers review. 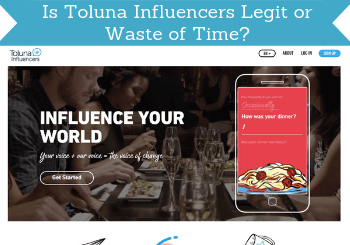 What is Toluna Influencers, and what does the site offer? This survey panel used to just simply be called Toluna. In 2018 it, however, changed its name, so now the official name is Toluna Influencers. But you might hear either name used, and many people still just call it Toluna – both names are however referring to the same survey site. It is, first of all, a survey site, where you can get paid to do online surveys, and it has existed for many years. 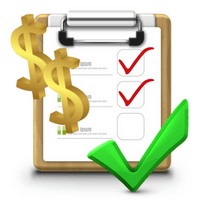 In addition to paid surveys, the site also offers a number of other ways you can earn money. Below I will go over the ways you can earn as a member of Toluna Influencers and all the opportunities it offers so you can easily see if it has what you are looking for. Surveys are the main way to make money on Toluna. There is a good amount of surveys, and mostly you will have access to at least 5-10 a week, but sometimes also more than that. Toluna Influencers offers a good amount of surveys. If you do not qualify for a survey (which in my experience does not happen as often on Toluna Influencers as on some other survey sites), you will still get 200 points for having attempted the survey. It is a good idea to log in to the site regularly and check, if there are any available surveys for you, as you, in general, will not receive emails when there are new ones. You will once in a while receive an email when there is a new survey, but most often it is then an extra survey that you cannot necessarily see on the platform. If you receive one of these email invitations, it is best to take the survey as soon as possible as surveys like this often fill up quickly and often only a limited number of survey takers is needed. But mostly you will not get email invitations when there are new Toluna surveys available. So to get the most out of the site, it is good to log in regularly. The surveys on Toluna do in general pay pretty well in relation to the time spent compared to other survey sites, and you can always see before starting a survey how much you will get, and how long it will approximately take, and then decide whether you want to take the survey or not. Also, when you first join, you can fill out some small profile surveys. They will give you some nice rewards from the beginning, and at the same time it will help you being matched to more surveys, so these are definitely a great idea to fill out, and a good way to earn right away. Toluna sometimes offers you to participate in product testing. It will not as such be a way to earn money, but if you are selected to test a product, you get to keep it, after you have tested it and sent some feedback to Toluna. That way it can be a great way to get to try and get to own new products for free. On the site, you can see what products you at the moment are able to test, and you can also see the next couple of products that will be available. Usually, there is 1 product a week, and a new product every week. You can also see how many of these products that are available to be tested. It is very easy to register for testing these products. Registering does however not guarantee that you will get to test the product, as there are a limited number of each product. To register, you just simply click the “Test” button in the overview (see picture below). The needed number of testers will then be randomly selected. The exact products and the number of available test products will vary from country to country. This option might also not be available in all countries and the availability is in general very limited, so it is not something you should plan on participating in a lot. Sponsored polls are polls about a certain topic that you can get 15 points to answer. They are also called quick polls. Once you log in, you can see if there are any available in the recommended section and in the news stream. You can spot them from the rest of the content by looking for where it says “vote”. Keep an eye out for the “Vote” polls to earn some quick extra points. 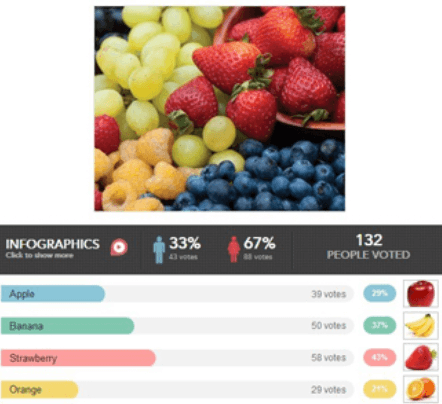 These quick polls give very small rewards, but also only takes about 10 seconds to do, and they can even be quite interesting to participate in, as you can also see a statistic about other members’ answers once you have answered. Toluna is not only a survey site but is also trying to be a community, where members can create content and interact. The way you can do this by creating or participating in what is called polls, topic discussions, or battles. Polls are just short polls, and topics or small discussions where people can express their opinion and interact about a certain topic chosen by the creator. Battles are where you can make a little battle between two choices to get peoples’ opinion between two things. It could, for example, be beer vs. wine, Superman vs. Batman, apples vs. oranges etc. You can earn by creating your own content on Toluna. You can earn up to 1000 points for each piece of content you create. This will be rewarded manually as the Toluna team want to encourage engaging quality content. So if you are good at creating interesting content, this can be a great way to earn some extra points. Toluna Influencers offers a number of different contests. The biggest one is the quarterly sweepstake. This is a contest you can enter by buying tickets for it with the points you make from doing surveys. The winning prizes are in general pretty big, and can, for example, be a new TV, phone etc. Of course, the chance to win in a sweepstake like this is not huge, and whether it is something you want to use your points for, or if you want to get your rewards paid out, is a matter of personal preferences. Be aware that to be able to participate in these sweepstakes, you have to have a profile image, and be what is called an active member. An active member just means that you have had to participate in or create a poll or topic discussion within the past 3 months. There are also other kinds of contests on the site, and these can make you extra money and will not cost you anything to participate in. It can, for example, be a contest to post a photo about a certain topic where a winner is selected, a quick quiz, or other kinds of contests. They can run for a few days or up to a month and can give you some nice extra cash in your account. Once you have logged in, you can see the newest announcements, and see if there are currently any new contests. They will also be announced and explained further on the official blog of Toluna for your specific country, that you can find a link to at the bottom of their website. The exact amount of contests depends on the country you live in – some have daily contests, some weekly, and some monthly. There is a daily game on Toluna Influencers called the Toluna Fortune Wheel. Here you get a daily chance to win some extra points by spinning the wheel. 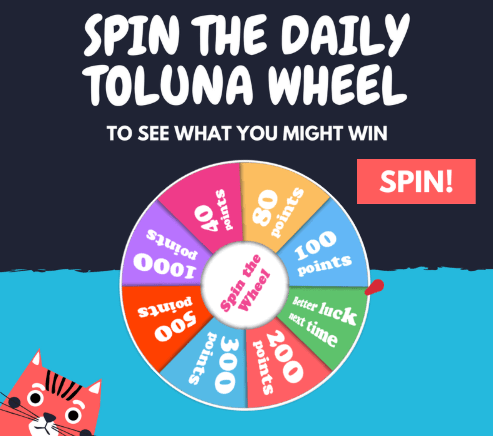 The Toluna wheel gives you a daily chance to win free points. It only takes a few seconds to do, so if you are on the platform, it is worth just trying your luck. Proof that you can actually win on the daily wheel – I have won points there myself. Not huge rewards you will get, but some extra free point by just spinning a wheel is still not bad. Toluna has an official blog that can be quite interesting to follow if you are a member of the site. You can find a link to it a the bottom of their website. It is not as such a way to earn, but it is updated with news often, and this is where you can also see new contests, previous winners, new additions to the platform etc. and see more details about all these things. So it can still be a good idea to check out the blog once in a while to keep updated about what is happening on the platform. There is a blog for each country where Toluna is available, so you will only get information on the blog that is relevant and available to you, and in your local language. As a member of Toluna, you can register your phone number on the site. 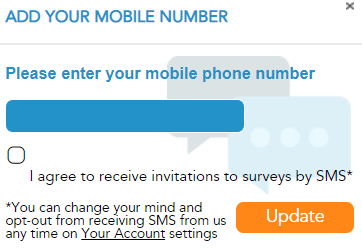 The advantage of doing this is that you can then opt-in to receive special mobile surveys via SMS. You can register your phone number to get access to special mobile surveys. You should not expect a huge number of extra surveys like this, but there are at times surveys that will be sent via SMS that are not available on the platform. You can opt-out at any time, and Toluna is a trustworthy and reliable company so you should not worry about if they will misuse your number. So if you want as many earning options as possible, it can be worth considering registering your mobile number. But you will also get plenty of surveys without registering your phone number. The earning opportunities on a survey site is not the only important thing. It is also very important how you will get paid. On Toluna Influencers, you will earn points for every survey you do. These points can be exchanged into cash for your PayPal account, different vouchers, or entries into Toluna’s monthly cash lottery. 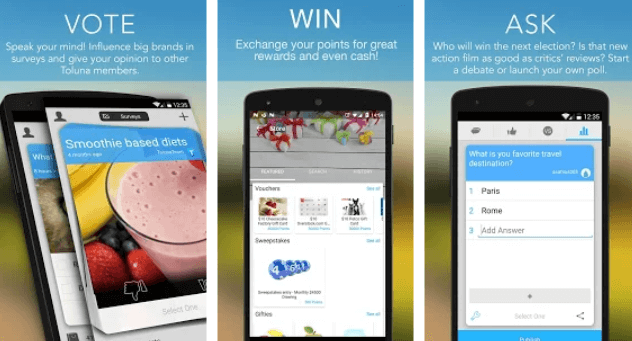 Examples of rewards you can exchange your Toluna points for. As you are earning points and not cash, it can be a bit confusing to figure out exactly how much you get for participating in a survey. But once you have calculated it once, you will know for the future what the points correspond to in your currency. I have calculated that in dollars, $1 is approximately 3000 points. This can vary depending on your country and your currency, so it is a good idea to calculate for yourself as well. 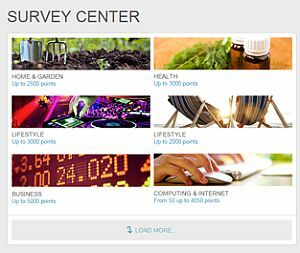 Most surveys will give you between 2000-6000 points. Once you have done a survey, you will not be able to see the points on your account right away. You can usually see them the day after, as the result and participation needs to be confirmed before you get your points. How many points you need to get a payout depends on the country you live in. But usually it will be around $7-$10 which is a fairly low payout threshold, and it will not take too long to reach with the amount of surveys you can find on Toluna. Be aware that the points you earn on Toluna Influencers can expire. 16 months after you have earned points, they will expire and disappear from your account. 16 months is a pretty long time, and most people will probably also want to cash out as soon as they can. But in case you like to gather as many as possible before cashing out, just remember to not wait too long. How much time do you have to spend to make money? It is fairly easy to make enough for a payout or a reward on Toluna. But how quickly you can do it, of course, depends on how often you do surveys, and if you use some of the other ways to earn points on the site. From where I live, I have calculated that usually, you will spend around 10-15 min for a survey that gives you 4000 points. That is definitely ok for a survey site. And at the same time, the surveys are often about interesting topics where it is great to have your opinion heard. You can also create content on Toluna yourself and can get extra points for this. If you manage to make content that will get you a reward, it can be a pretty fast way to make a bit extra, as the polls and questions you can create take very little time to do. But you will not know before you do it if you will get rewarded. It will give you between 100-1000 points – so if you do use this option, be sure to create something that is interesting for people to participate in. You can also make extra points by inviting friends to join Toluna Influencers. Once you are logged in, you can see some buttons under your username, where you can share a link with your friends through social media or email. You will however only get 500 points (around 15 cents) for each friend that joins, so this is not a way to make very many points. Just remember, like with any other survey site, you should not calculate an hourly pay, and then see if it is worth joining. Doing surveys will not give you a full-time income online or make your rich – that also goes for Toluna. But it can be a great and easy way to earn some nice extra money and at the same time have your opinion heard. How to use Toluna Influencers? To give an idea about how to find your way around Toluna and how to use the site, I have made the short guided video tour below. There are a few of the options that were not available when I created this video, but it will still give you a very good idea about how to use Toluna and how to find your way around the site. Can you take Toluna surveys on mobile? If you like to make a bit of money on the go, it is great to join survey sites with a mobile app or that at least are mobile friendly. Toluna is one of the sites that has an app, and you can download it for Android or iPhone. The Toluna app gives easy access to earning on the go. It is fairly easy to use, but if you want to use it, I would recommend to first sign up on the website and get familiar with the options here, and then start using the app. In my opinion, the website still gives the best overview and experience, but the app is great and easy to use, and can be a great addition and a quick way to check up on the options on the site during the day. How good support a company has, often tells a lot about that company. If you should need any help or technical support, I know from personal experience that Toluna’s support is quick at getting back to you. That tells a lot about the trustworthiness of a site. If you have more general questions or some tips you would like, you are of course also very welcome to leave a comment for me below. I can give you a lot of tips as a user, but in some cases, you might need some support from the official site, and then it is good to know that this is possible. Who can join Toluna Influencers? Toluna Influencers is more or less available worldwide, and in the national language in most cases as well. The Toluna blog is also available in most languages. This makes it a very user-friendly site. The rewards and the amount of points in relation to time can vary from country to country. I really like that Toluna has specific sites for so many countries. Contrary to many other paid survey sites that mostly have opportunities for English speaking countries, Toluna has for a lot more countries. Toluna Influencers has survey panels all over the world in the local language. 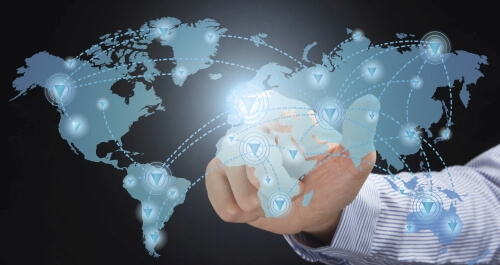 You can of course find good opportunities on Toluna Influencers in the US, Canada, Australia, and the UK, but also really good opportunities in countries like India, Singapore, Malaysia, Denmark, Sweden, Belgium, Japan, New Zealand, Russia, UAE, South Africa, Hong Kong, China, and in many more countries. I cannot list all the countries it is available here but just wanted to give you an idea about how many different parts of the world it is available in. This is one of the big advantages of Toluna, and it is not only available in many countries, but also offer a good amount of surveys in most countries. In most countries, you can sign up when you are 14 years or older, but this can also vary from country to country depending on the local laws. Be aware that if you are under 18 years old, any rewards might have to be paid out to a guardian or parent – again this depends on your specific country, but on Toluna’s website for your country you can find the exact rules for your country. Just be aware that you will not be able to do surveys if you are in another country than where you signed up, so you cannot do surveys while traveling. Final verdict – legit and worth it? Toluna Influencers is definitely legit – I know this as I have been paid by it many times myself. Overall I really like Toluna Influencers, and it has many good opportunities. It is, however, a bit slow to pay out in some countries, once you reached the payout threshold. If you start using Toluna regularly, you will also start being able to request payments regularly. And then you will often get the money into your account, and then you will not notice the wait anyways. So overall, Toluna is a good and reliable paid survey site, it has many opportunities, is easy to use, and it is definitely legit and safe, and I have benefited a lot from being a member myself. So definitely one of the survey panels I recommend joining. How do you sign up for Toluna Influencers? It is very easy to sign up for Toluna Influencers. You can just click the link below, choose your country, and that will take you to the site, where you have to fill out some basic registration info (takes less than 1 minute). Once you have signed up, you will receive an email confirmation. Be sure to open this and click the link in the email to confirm your account. Once this is done, you can start doing surveys. If you have any experiences with Toluna Influencers yourself, feel free to share your experiences below. It would be great to have other Toluna reviews from other users below this review as well and hear about your experiences in your specific country. If you have any comments or questions, also feel free to leave a comment below, and I will get back to you as soon as possible. Toluna Influencers is one of the big survey sites, and it is a very reliable and safe site. It has decent rewards for your time, frequent surveys, and several other opportunities to make money and also to interact with other users. You can get paid through PayPal or get vouchers and it is available in many countries. All in all, a very good site that is easy to use. I have a bad experience with them. I live in Netherlands and I have many prblems with them. 1st I have reached more than 130000 points but can not redeem them. the redeem knop in the site does not working. I tried hard to participate in the game toluna memory but I played only once and till now it says you have already participated however It is supposed to be played everyday. in my paypal details my email address can not be saved. this is despite of having many other issues. I contacted them many times to the degree I have no interest to write anymore. Nothing is solved they even answer very late. It is true that the surveys are widely available but when you get closer to the redeem ammount you hardly get a survey and at the end you are not qualified. As you get the enough points to redeem them there will be many obstacles and I didn’t face them in other survey websites. I could easily get paid by other websites such as lifepoints, Time bucks and Euroclix. I am really disappointed with Toluna Netherlands and do not know what to do to gain my right. Sorry to hear about your problems Vian. Does not sounds fair that the support is not trying to help you with it. My suggestion would be to maybe try to write them through their Facebook page as well – sometimes different people manage that so maybe the support for Netherlands on FB is more helpful. Or if that does not help maybe try to write the main Toluna office internationally. As far as I know, they have different support in different languages so maybe it is just really poor support in the Netherlands and maybe it could help to make the main office aware of this. Anyway, thanks for sharing your experiences here. And also glad to hear you had good experiences with LifePoints, Timebucks, and Euroclix. Finally I could solve the redeeming problem. 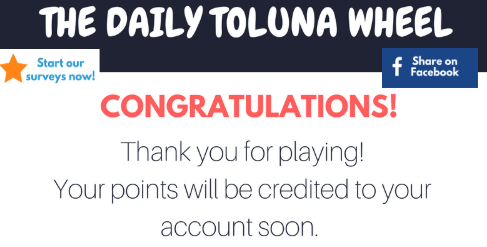 Today I downloaded Toluna app and through the app I could redeem the points. This is by accident came to my mind. I hope that others get benefit from my experience. That is great to hear Vian. Thanks for the update. It is very good to know if somebody else should end up in the same situation. You just click the join button on the page above, choose your country, and then you will be taken to the sign-up page. There is not always surveys available. So just check again later or next day. New surveys are regularly posted. Right here around New Year there are, however, less than usual, so you might have to be a bit more patient to find them. I was wondering if this Toluna opportunity managed to sidestep one of the most common survey downsides – the unreasonable screening out? Basically, does Toluna kick you out of the survey for demographic reasons AFTER you have already answered 10 or so questions? It used to drive me up the wall – the survey provider gets 10 free answers and then you get nothing…wasting several minutes in the process!!! In my experience the qualification percentage on Toluna is higher than on many other sites. You will still not qualify for every survey, but you will find out quickly if you qualify or not. And in most cases you will even get a few points, if you do not qualify. I joined Toluna today from India. It pays lows and hence the bad rating, but most sites mention that the number of surveys are more. Lets see..
Hope you will like Toluna and find a good amount of surveys there Rohit. Feel free to come back and keep me updated about how it goes. Would be great to know. Why do I always get an error message when clicking surveys in Toluna? What kind of error message do you get? Maybe I can give you answer, if I know this. It is also possible for you to write Toluna’s support directly depending on the kind of error you get. If it keeps saying this, it does sound a bit strange. Could sound like maybe there is an issue with your IP or something like that. I would suggest you to contact the Toluna support and have them take a look at your account, so you can find out what is going on. And feel free to keep me updated how it works out. Would be great to know. Not sure I completely understand your question. Do you mean if you can take some of the same surveys Toluna offers through ClixSense? I have not myself seen any of Toluna’s surveys offered through ClixSense, but maybe you have seen some? Thanks for useful inbformation. I want to register but can’t find Kazakhstan on the kist of countries. Does it mean not available for Kazakhstan? Hi, I signed up to Toluna UK a few months ago; I don’t get points when I attempt but don’t qualify for a survey; I just get entries to the quarterly sweepstake. On the plus side, when I have claimed rewards (which I have done a few times now), they usually actually come within 2-4 weeks; I haven’t yet had to wait the full 8 weeks! Thanks for your feedback Su. Interesting to hear that you get entries into the sweepstake when not qualifying. Have you kept an eye on your account after having not qualified for a survey? Because it is not something that it says after you do not qaulify. I have just noticed that usually around a couple of hundreds points go into my account when I do not qualify. Hello Mikael, thank you so much for your honest review on Toluna! We really appreciate you taking the time to clearly lay out your thoughts on our company. If you ever have any questions or further feedback please feel free to contact us directly. Thanks for stopping by and looking at my review and feedback. Great that you are willing to look at the feedback you are getting online. In this day and age, it’s too easy to get caught up in online scams. Some are so elaborate that you can’t tell they’re a scam until it’s too late. I had never heard of Toluna until now, but that’s the reason that I’m glad sites like yours exist! Keep on keeping people safe out there! Thank you for your very honest review. I’m always skeptical of survey sites because I feel like it’s not a worthwhile way to make money online, especially when there are a lot of misleading marketing on how much money you could make filling out surveys. Like you said, these places are good for making a little extra cash, but you won’t be able to live off of it. Most people want the straight bottom line for these places–how much can I make in an hour? I like that this site is user-friendly and has extra features like content creation. It’s on my short list for recommendable survey sites. Thanks for you comment Maxwell. It is very difficult to give a straigth answer to how much you can make in an hour. There are so many variables to that. But if you are aiming for a high hourly pay, surveys will not give you that. You should not do it, if this is your goal. But it can give some nice extra money on the side, and there are also other reasons to do surveys. So if you start surveys with those expectations, it will be great, but if you start doing it to make a high hourly salary, you will be dissapointed. Hope this helps a bit, even though I cannot give a more straight answer than that. I just found out about Toluna from your article, and it looks interesting. You have reviewed it objectively, the advantages and the disadvantages. Thank you for sharing. This is a useful and informative post for people new to making money online. What is the best survey website to get income in your opinion? Which survey sites are the best depends where in the world you live. On my top 10 list, you can get an overview of the best sites and see which countries they are available in. Just please remember that surveys can be great to earn a bit of extra cash, but do not expect to be able to make a living from it. Then you will just be dissapointed. It is true that you wll not qualify for all the Toluna surveys. Sometimes they are looking for a specific audience, which is the case for all survey sites. I do however find that I in general qualify more often on Toluna than on some other sites. Interesting that you have done surveys that are so long. I have never tried surveys that are 1.5 hours long on Toluna or on any other site. I think the longest that I have ever been offered is maximum 40 minutes. But personally I prefer the ones that are maximum 15 minutes which luckily are the majority. Hi what an impressive looking website you have here, i particularly like the star rating system you have in place,Makes it easier for sorting through the surveys.Toluna uk is now in my bookmark bar, and I am certainly going to be giving them a go! I am part of another online survey site but they email me all the time! Glad to hear you like my site and find it useful Stuart. Yes some survey sites sends a lot of emails. It can be nice if it is because they are sending emails about available surveys which it often is, but a few are also sending emails for other reasons. But almost all of the legit sites have an option to choose how often you want emails. Hope you enjoy Toluna UK if you decide to enjoy. And feel free to give me an update how you like the site. Would be great to hear. I like the fact that even if you fail the screen surveys, you still get rewarded some points. Other survey sites, do not give you anything for all that precious time that you spent. Toluna is a different survey site than from what I normally see. I like the contest part and that one can engage in a community environment. Though I must admit that waiting for 8 weeks to get paid is a bummer. Nevertheless, it is free to join. I will be giving it a go. Sounds like fun. Thanks for sharing your thoughts Roopesh. Yes it is definitely a plus that you get some points even if you end up not qualifying for a survey. Enjoy it, and let me know if you get any questions, and also feel free to update me on how you find Toluna. Just checking out your web site. I had no idea one could make money from doing surveys! With your wonderful organization of your posts, I found it easy to check out all of the different companies that you recommend. I am saving this to my favorites and will be checking it out more later when I have more time. Glad to hear you find my website useful Clyde. Thanks for letting me know. Very informative. Thanks for the info. You are welcome. Glad you found the info useful.